St. Paul’s Hospital Millennium Medical College appointed two celebrated artists as the hospital’s ambassadors. The appointees are Tsedenya Gebremarkos (a singer) and Azeb Worku (a playwright and actor). The ambassadors will use their popularity for raising the public’s awareness about health. Azeb will be involved in working to improve maternal and child health services while Tsedenya will work on improving the cleanliness of the hospital. 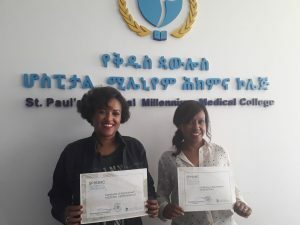 Dr. Lidia Tefera, vice provost of St. Paul’s for medical services, said that the ambassadors would play a crucial role in pointing our gaps in services which medical professionals might not notice due to their preoccupation with their primary duties. They will also follow up the plans of the hospital and check their implementation. The hospital is planning to carry out a cleaning and blood donating activities coordinated by the ambassadors in the near future. The ambassadors’ service to the hospital will last two years.